This holiday house Richard is nestled amid beautiful surroundings in the quiet, authentic mountain village of Le Boisset. This holiday house Richard is nestled amid beautiful surroundings in the quiet, authentic mountain village of Le Boisset. The house has its own swimming pool and a terrace from which you have stunning views over the Luberon. You will stay here between Apt (15 km) and Cereste (15 km). Places such as Aix-en-Provence and Avignon, the mountains and the coast of the Mediterranean are reachable very soon from the house. Enjoy beautiful hikes or go on a bike trip on the new bike path, which was formerly a railway link that leads from the Rhone valley to Forcalquier. The amiable owner and his wife live in an apartment below your house; they have a separate entrance. The owners have no view of your garden, swimming pool or terrace. The house Richard is a very unique place and an excellent base for exploration of the old village and the versatile region. You can relax to the fullest at the swimming pool. The agent has rated it as a three star property so it is a well-kept villa, equipped with standard furniture. It is also good value for money. 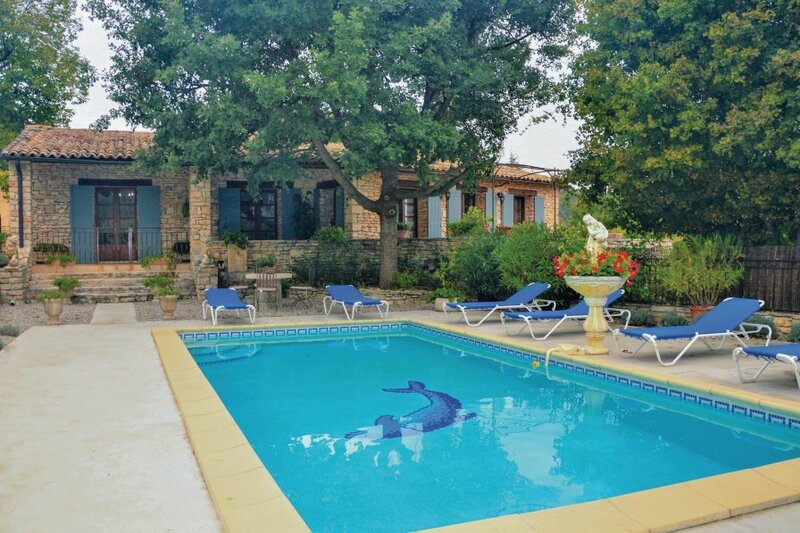 This villa has a private pool and is located in Saint-Martin-de-Castillon. It is set in a good location: there is a restaurant 6km away.